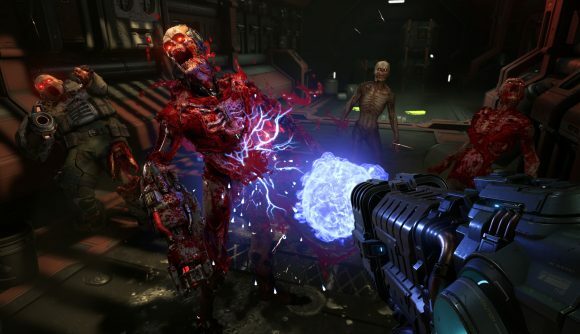 March 24, 2019 Doom Eternal developer id Software suggests it helped shape most of Stadia’s gaming features, such as matchmaking, save games, and Achievement tracking. Doom Eternal was the big game reveal for Google’s Stadia game streaming service earlier this week, and a huge get for the platform, but the relationship apparently wasn’t one-sided. Doom developer id Software apparently worked with Google on improving Stadia, and it’s thanks to id’s advice and support that the service has some major gaming features on it. id Senior Programmer Dustin Land spoke at GDC, and described the journey the studio took in regards to Google Stadia – going from a “lackluster” early showing in 2016, full of noticeable lag, to being “stunned by how much things had improved” later in the year. Nevertheless, according to Land (thanks Ars Technica), the first version of a Stadia development toolchain was just “bad”, with a lot of bugs, and it took a lot of complaints from id to get Google working on it. Furthermore, the original version was just game streaming with controls – but with id’s input, the Google Stadia team added “Achievement tracking, identity and profile management, leaderboards, parental controls, save games, stat management, matchmaking” and social aspects. Google revealed its revolutionary Stadia game streaming service earlier this week. Bethesda and id Software’s upcoming Doom Eternal was revealed to be coming to Stadia – and impressively, doesn’t seem to be compromised by the streaming platform. Despite streaming to Google Chrome via Stadia, Doom Eternal will run on the service with all the bells and whistles PC gamers desire – including true 4K resolutions, HDR colour, and running with a framerate of 60fps. Considering this is all running entirely over the internet, and with no powerful PC or console required on the player’s end, it’s incredibly impressive – and a potentially revolutionary proposition, too. Doom Eternal executive producer Marty Stratton from id Software took to the stage to talk about how “great” Doom Eternal looked on Stadia. While the game itself is officially only announced for PC, Xbox One, and PS4, with Google’s new service you supposedly could run it on anything – even phones. “If you’re going to prove to the world that you can stream games from the cloud, what better proof than Doom?” Stratton added. Google’s Stadia will launch later this year, so potentially around the same release date as Doom Eternal – although we’ll have id Software to thank the moment we go to save our progress.